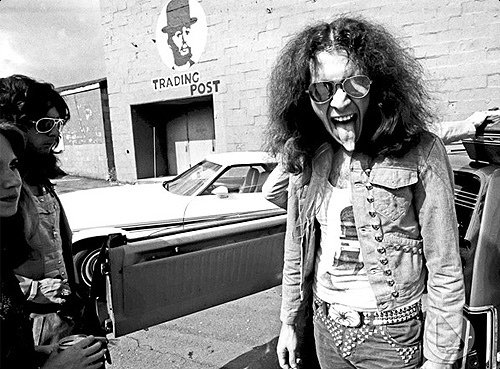 When I was a kid listening to KISS back in the 70’s I truly thought these guys had magical powers. And why wouldn’t I right? There were absolutely no photos of KISS without makeup and they played their roles so perfectly both on and off stage. Then when I saw KISS Meets the Phantom of the Park, there was no doubt in my mind that they were superheros. Sure if you watch the film now it’s absurd and quite embarrassing (yes the band agrees as well), but at the time, it was no worse than say, The Greatest American Hero, or The Million Dollar Man. Plus, it had rock n roll incorporated which the other two lacked. 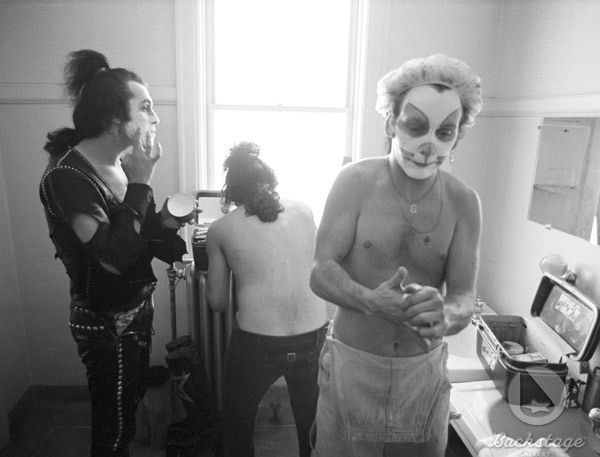 So the other day I have an idea to search to see how many photos have surfaced of the band without makeup from back in the day. Not surprisingly there are still not a ton but there is a set that I found from 1974 with a particularly interesting story. Apparently the band showed up at Creem magazine for a photo shoot waltzing in as four regular rock n roll dudes. Then they excused themselves to get into character The result was an incredible photo shoot of a band that really wasn’t that popular at the time. The editors at Creem were early believers in the band and continued to support them even though most mainstream media would ignore the band until forced not to. 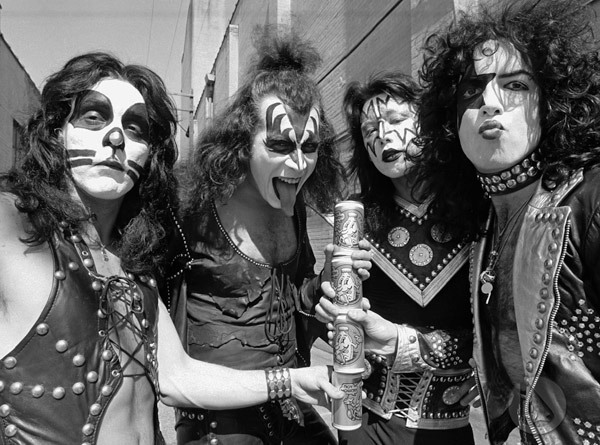 Anyway, the story goes that after the band finished their photo shoot in full KISS garb, the band got back into their street clothes and walked outside. The photographer told them that he had called KISS’s management and OK’d a few photos of the band without their leather and makeup. 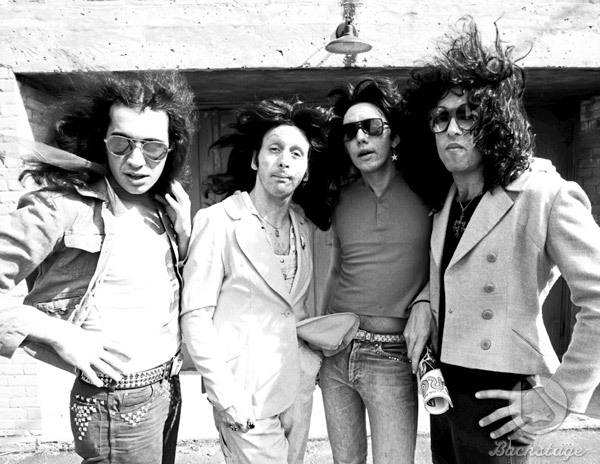 Gene, Paul and company were hesitant at first, but since their management had said yes (which it turns out they did not) the posed for a few candid shots. The result is what you see below. Creem did in fact keep these photos under lock and key for quite sometime, and from what I understand these are the only pro shots of the band taken during the makeup period. Fascinating stuff. At the risk of being Stiggy-come-lately: Thanks for this! 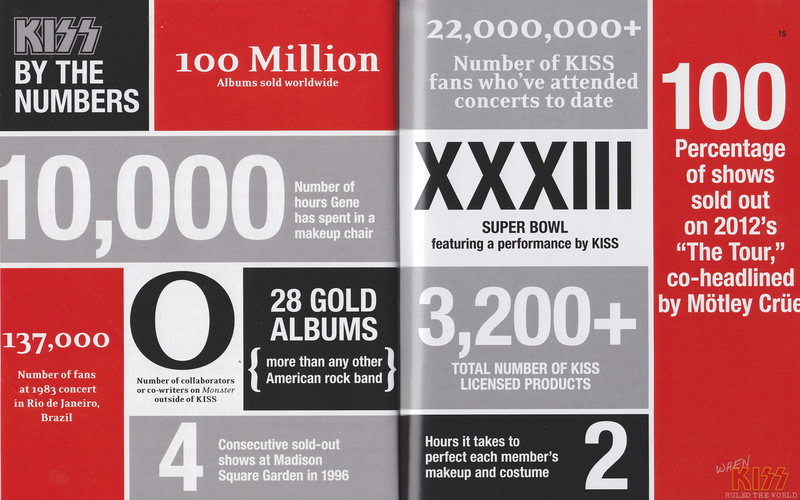 My whole introduction to pop/rock music came through Kiss. Thoroughly enjoying these pics – when I was 10 I’d never thought I’d see pics of the guys sans makeup, but that’s the InterGoogle for you. Now, just a couple of years later I’m fulfilling ten-year-old Stig’s dream of seeing his heroes au naturel (hopefulle not too naturel). Thanks! Listening to Cold Gin as I write. KISS is awesome with or without makeup. My brother LOVED KISS his whole life so i grew up listening to them as long as i can remember. Unfortunately my fabulous brother died december 2014 so i dont see or hear KISS much anymore. Im getting an Ace Frehley tattoo in honor of him soon Ace was his absoulute favorite he also played guitar very well. Well anyway KISS ROCKS NO MATTER WHAT THEYRE WEARING!!! 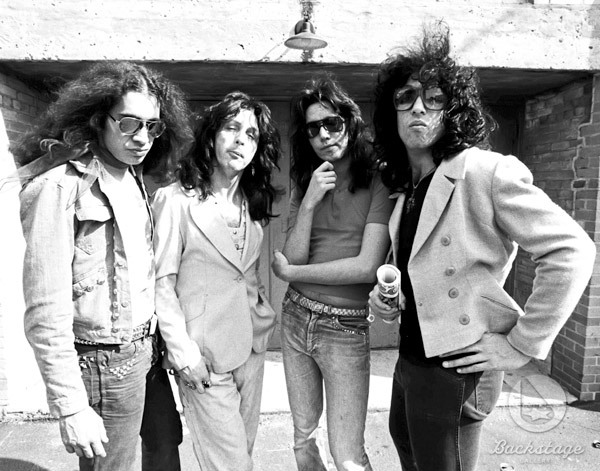 LOVE EM..
Been a kiss fan 40 yrs these pics are cool to see now .back in 1977 when I was ten I thought these guys lived and slept in their suits and makeup still like them and just as fascinated with them as then .they worked hard at an idea and never gave up no matter what some people said!